inferior in condition or quality, shabby, run-down. Definitely not. somewhat disreputable. Don't think so. slightly unwell, debilitated. Nuh uh. containing or full of seeds. Oh yeah, baby! Especially if that thing containing or full of seeds is a bread. Seeds is (are?) 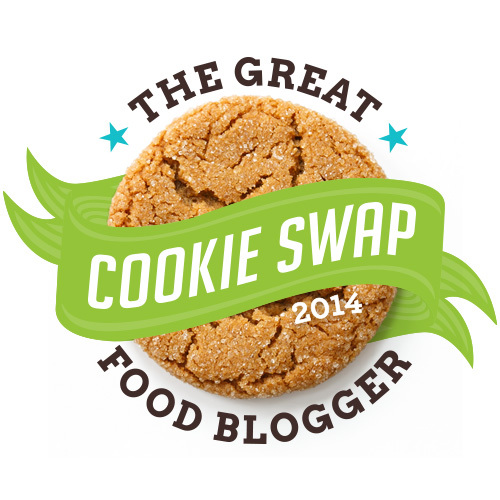 the theme for this month's BreadBakers challenge, chosen by our host Karen of Karen's Kitchen Stories. Last month's Montreal Bagels notwithstanding, they're not an ingredient I use often. I tend to approach seeds with a bit of trepidation because many of them, mostly the larger ones, veer much too close to nut territory for my liking (my disdain for all things nut is legendary and I've pretty much made whining about them into an art form). 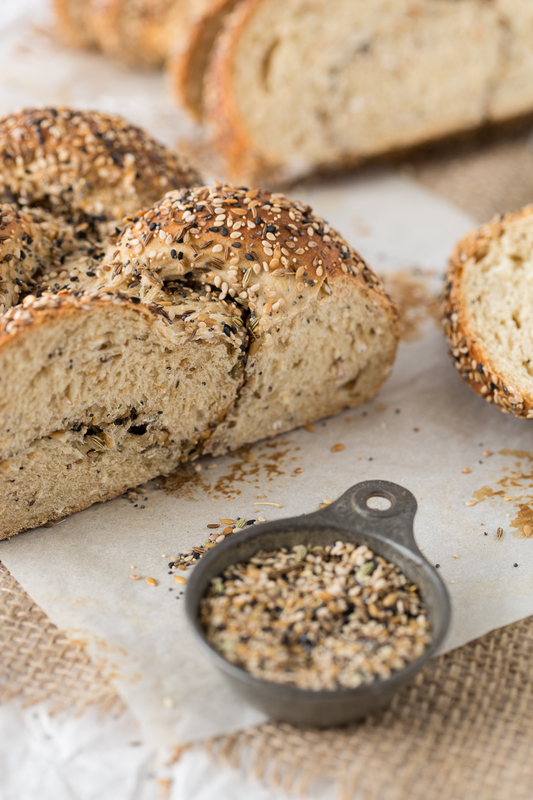 I'm okay with the smaller seeds though, the teensier the better, which brought me to this bread–a crunchy seed braid that's about as seedy as you can get. It's loaded with 'em, itty bitty ones, inside and out. Confession Time: This braid wasn't my first effort. I originally planned to make this mixed seed bread from BBC Good Food. It might have been a good one too, but for one teeny tiny but very important error in the published recipe–a missing space. As I found out too late, you don't add a 125 gram packet of sunflower seeds to the mix. Nope, it should read 1 25 gram packet. That's ONE 25 gram packet. See the difference that missing space makes, BBC? 25 grams of sunflower seeds will get you a nice seedy loaf of bread. ONE HUNDRED and 25 grams of sunflower seeds will get you an inedible lump with the density of a curling stone. Seriously, in a pinch it would be a great stand-in. Even the birds wouldn't eat it. They literally flipped me the bird (groan) and left it to rot in the snow. SO FIX THAT MISSING SPACE, BBC, OKAY? Thanks much. 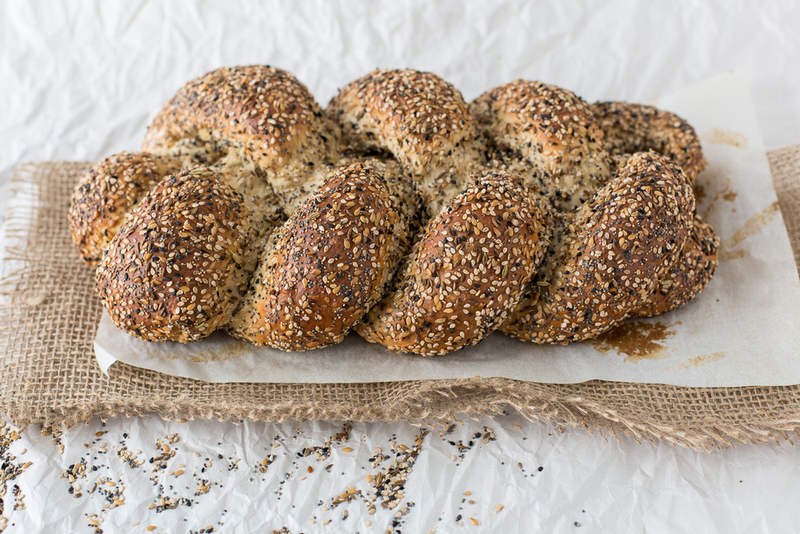 The dough for this bread, however, is VERY easy to work with and the resulting braid is a hearty, flavorful, (dare I say) nutty, crunchy, seedy extravaganza that holds up to just about anything you pair it with. (Did someone say cheese?) Definitely one to try. Be sure to check out what the other BreadBakers came up with this month! Place all ingredients except for the seed mix coating in the bowl of a stand mixer and mix on medium speed for approximately 8 minutes. The dough should be soft and smooth. Place the dough in a lightly oiled bowl, then cover and let rise in a warm spot for about 60–90 minutes until the dough is puffy (it may not double). Transfer the dough to a work surface, gently deflate then divide into three pieces. Roll and stretch each piece into a 16" rope. Dampen a lint-free kitchen towel and place it on a sheet pan. Add your seed mix coating to another sheet pan. Gently roll each dough rope in the damp towel, then transfer it to the sheet pan with the seeds and roll the rope in the seeds until it's fully covered. Transfer the coated rope to your work surface and roll gently to make sure the seeds adhere. Repeat with the remaining ropes then let them rest uncovered for about 15 minutes. Just before braiding, lightly spritz the ropes with water, then pinch the three ropes on one one end together and braid. Pinch the remaining ends together, then tuck each end underneath the braid. Place the braid on a parchment lined sheet pan, lightly brush with the egg white mixture, then cover and place in a warm spot to rise for about 1 hour. While the dough is resting, preheat the oven to 400°F. Bake the bread for about 30-40 minutes or until the braid is golden brown (tent the braid with foil if it looks like it's browning too quickly) and the internal temperature is 190°F. This recipe calls for King Arthur's Harvest Grains mix, which I happened to have on hand. If you don't, it's basically a blend of whole oat berries, millet, rye and wheat flakes, flax, poppy, sesame, and midget sunflower seeds. Really though, you can pretty much substitute whatever grains and seeds you like, measure for measure. This dough is so workable that I didn't have to flour my work surface at all, always nice since I tend to make a big mess with my flour. My seed coating was a total mishmash of whatever I had on hand. I used: flax, black and white poppy, black and natural sesame, caraway, lucknow fennel, anise and nigella. Phew. It was a VERY tasty mix, no one seed was overpowering. The wet towel trick is one I learned in my artisanal bread course at the International Culinary Center. Works every time, great coverage and gosh darn it, those seeds really STICK. The original recipe says to stretch the dough into 24" ropes but I thought this made for a somewhat wimpy braid, too long and thin. When I made it the second time, I stretched the ropes to about 16" and it made for a much more pleasingly plump braid.